This year, back-to-school is looking a bit different for my boy. He's 12 now and going into grade 7. (I'm sorry, didn't you just learn how to walk?) Besides the usual backpack and school supplies, he also has a new cell phone. If you're thinking, "Oh my gosh, he's 12 and you're giving him a cell phone," I totally hear you. I'm a bit of an old-fashioned girl myself. I'm not ready for my child to be face-down in a cellphone for the rest of his days. But I'm also a safety freak. There's a sculpture entitled "Worried Mom" that's modeled on my face. (Okay, not really, but that would be cool.) As a preteen, my guy craves independence, and rightly so. In order for me to give it to him, I have to reassure myself that safety measures are in place. 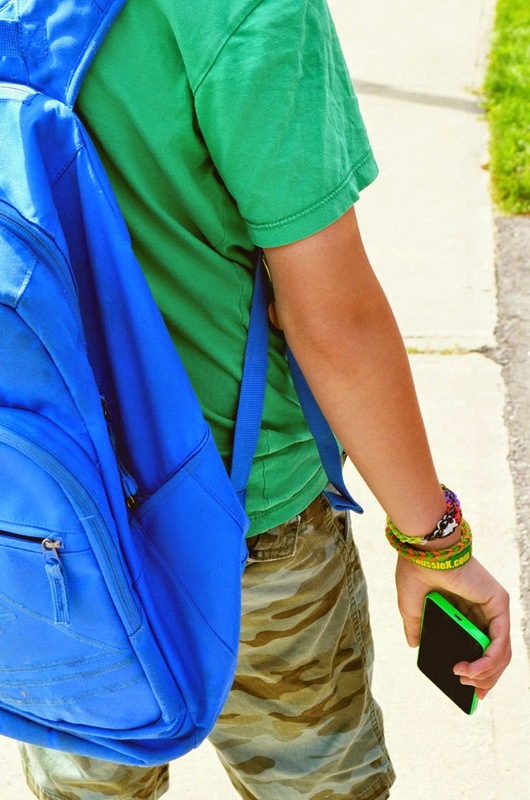 If he's walking home from school or headed to the park with some buddies, a cell phone lets me keep in touch. I can find out where he is or tell him it's time to head home for dinner. It's more convenient (and less embarrassing for him) than me running to and from the park every 10 minutes. From his perspective, it's just super cool. He loves his Nokia Lumia 635 smartphone from Microsoft Devices. To start with, it has a green shell so it looks really good. In Canada, the Lumia 635 comes in matte black at Rogers, Fido and TELUS, and changeable shells are available to buy, include our phone's glossy green, plus yellow and orange. For an affordably priced phone, the Lumia 635 feels weighty and solid. It features a 4.5-inch durable LCD screen. In perusing reviews of the phone, I noted that reviewers found it to be impressively solid given its affordability. It's a great phone for kids, seniors or anybody who wants a quality, easy-to-use phone with plenty of options without a huge price tag ($199 without a plan). The Lumia 635 is loaded with Windows Phone 8.1. So, for those who have Windows 8.1 on their computer (as I do on my laptop), it feels familiar. It's easy to use, because all your apps and features can be accessed through the colourful and clearly visible tiles. It's easy and quick to access Facebook, Twitter or email. You can also make the start screen distinctly your own by prioritizing those tiles that are important to you and adding a background photo. The Action Center allows you to access all of your important notifications in one place. With a downward swipe you can view missed calls, text messages, appointments and social media updates in one location. Save documents automatically with OneDrive - cloud storage is built into your apps so you can pick up your music, videos and Microsoft Office docs on other devices. The HERE maps feature means you can get directions for travelling by car, on foot and even via public transportation. Check out this video for a better understanding of this feature. I noticed that the phone functions quickly too, which is a huge plus. I have had phones that process slowly and it is a pain. Apparently the Lumia 635 has a powerful quad-core processor, which is too technical for me, but basically means it's fast. The keyboard is fast too, the fastest on the market. Another cool feature for teens is the free music via MixRadio. The feature puts together playlists for you based on a song or an artist that you like. You can even listen offline to avoid data charges when you're out and about. My son and I created some playlists based on Katy Perry for him and his sister to listen to in the car. Then I added a couple of mixes for me too (Nirvana, Radiohead, etc.) just in case I am in need of some music on the run. One thing you might worry about, particularly when supplying a cell phone to a child, is additional charges on your monthly bill. That may involve a careful conversation. But the Lumia 635 also allows you to activate WiFi sense so that the phone automatically switches to WiFi when it's available. The Data Sense feature allows lets you set a limit on data usage and helps to portion out the data so that it lasts over the month. It also notifies you when you are close to your limit. Although the phone doesn't have a front camera, it does have a Glam Me app to guide you in taking a selfie using the rear camera. My daughter and I loved playing around with Glam Me, because it also allows you to smooth your wrinkles, narrow your face and widen your eyes. Trust me, that produces some fun results! Activate the Nokia Lumia 635 on the Rogers LTE network for super-fast speeds to catch sports highlights, share photos on social media, stream videos and more, with virtually no buffering or delays. You can find out more about the Nokia Lumia 635 by following the hashtag #NokiaBTS. Are your ready for back-to-school? Is a new cell phone on the shopping list? Ah I remember the first phone! Such a modern milestone-- it really is an amazing tool, not just for safety, but also for information. I can't remember all the times the kids asked me something about something, and I answered, "look it up on your phone!". We've talked about good sources and bad sources, and when too much information is, well, too much. Awesome! We have a free family tracker app called Life360, it's installed on our phones (our son has a phone too, like you it's more a safety thing for me) and allows to see where the others are. Very handy!